The Miroir brand comes from personal experience. Its founder Mireille Mathys trained as a designer but had the misfortune to fall ill with cancer. That’s why she decided to create a collection of caps, hats and turbans for women who have suffered hair loss following medical treatment. 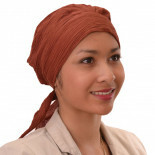 The brand aims to offer a choice of hats, turbans and caps that are both practical and stylish to ensure that women can look their best and smile when they see themselves in a mirror. A very soft little cap, with the emphasis on lightness and comfort!